I learned recently of another Apple-1 which came up for sale at an online auction held by the respected international auction house Christie’s in July. The winning bid of $387,750 was over 40% lower than the price paid for the previous example sold in May. The reason for this isn’t clear, as it was in similar working condition and is also believed to be one of the first batch of 50 Apple-1 machines supplied to the Byte Shop in April 1976 for $500 apiece. The seller, a retired school psychologist, had acquired the machine from the original owner in 1979 or 1980. Remarkably, he paid nothing for it, as it was part of a swap of computer equipment. He used the machine as a teaching aid for children with special needs for a few years before relegating it to a cardboard box at his home in California. 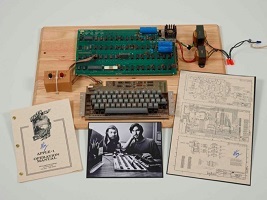 The auction, which was entitled First Bytes: Iconic Technology from the Twentieth Century, also featured a rare Apple Lisa and three Apple pre-production prototypes. Surprisingly, several items failed to reach their reserve price and were not sold. It will be interesting to see if this downward trend continues when the German auction house which achieved a world record price for the Apple-1 sold in May holds its next specialist auction on 16 November. The star of the show will be yet another example of a working Apple-1 computer from the first batch of 50, this time complete with its original box. However, in what may be a tell-tale sign of lower expectations, the estimated price for this item has been set at $300,000 to $500,000. This entry was posted in Computers as Collectibles and tagged Apple I, Auction, Byte Shop on 15/10/2013 by Stephen J Marshall.